Would you like to meet the Juvents? they are twins. I found them on Longboat Key. I have long admired the focus of Aging in Paradise, the resource center for older adults on Longboat Key that serves islanders from Anna Maria to Lido and the mainland nearby. The organization is about “education, care-giving, wellness, socialization, memory, and age-related transition support” for people who want to make “every moment count” in the aging process. So, I stopped by the other day. that is when I met the twins. Aging in Paradise is affiliated with the Longboat Island Chapel at 6200 Gulf of Mexico Drive on north Longboat Key. The chapel is interfaith and made a very large second floor space available for the resource center, which is self-funded. The very committed and energetic executive director Donna Dunio graciously gave me a tour, filled me with information, and then introduced me to the Juvents. A Juvent is a biomechanical stimulation system that promotes blood flow and better bone health. (You were convinced it was human, weren’t you?) 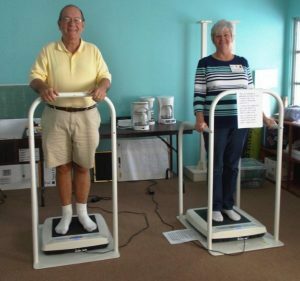 You stand on one of these sophisticated pads for as little as 10 minutes a day to improve muscle fiber in the soles of your feet. that is good if you need to walk better, or for a greater distance. And it just may help you not fall down. There is also healthier blood flow from this simple experience. Aging in Paradise has two Juvents. They are expensive units, about $3,500 each. They think about you when you first stand on them, calculating how to respond based on your weight and body composition. Donna will tell you the best way to use them. And she will ask you a couple of questions about your health before you step on the pad. Aging in Paradise is more a community information resource than a place with machines to improve blood flow and muscle fiber. They form partnerships with other community resources and offer classes directed toward healthier living, and advisory seminars for more informed decisions when making life choices. They arrange sessions to help with loss and transition, and can arrange trusted assistance for dealing with everyday crises. They will collaborate with anyone assisting older adults, and they carefully research those individuals and organizations before working with them. All are welcome. The organization’s hope is to give people “peace of mind, bring joy, comfort, knowledge, and security” along the path of later life. The Island Chapel made the space available, and volunteers and donations help Aging in Paradise achieve its one, simple goal – working with community organizations and individuals which can serve as a resource and clearinghouse to help people age gracefully. They keep regular daily hours and are available online at www.aginginparadise.org. You may telephone them at (941) 383-6493. Use their services, volunteer your time or money, and if you pay a visit, say hello to the twins for me.